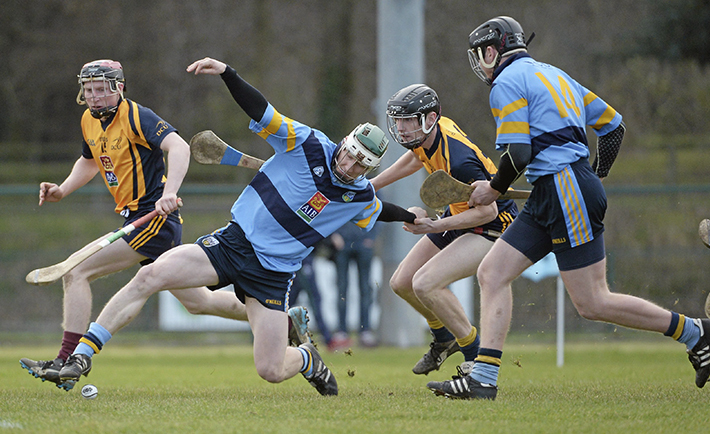 It was the case of two very contrasting years for the DCU hurling club. They began their campaign in early October with an outstanding series of victories, the highlight being a stirring comeback to beat UCD in the local derby by one goal. Drawn in a very tough group for Fitzgibbon, including tournament favorites CIT, expectations were that DCU could progress to the knockout stages. This was not to be. DCU managed only one win and failed to qualify from their group. Manager Nick Weir was very disappointed given the effort put in leading up to the championship. The team never really recovered after a disappointing result in their opening game against CIT. In a match surrounded by controversies over an early sending off of Peter Carroll, DCU lost by an eye watering 1-6 to 0-17. With this deflating loss and with the now absent Carroll, DCU succumbed to a strong UCD outfit, losing by a margin of 2-16 to 1-14. The chance of getting out of the group was now truly over but the team pulled themselves together in order to avoid the embarrassment of the wooden spoon and defeated St. Pat’s in their final game with a score of 1-20 to 0-11. The quality of the Fitzgibbon competition was apparent this year. Inter-county stars littered every team sheet and high profile mangers and trainers prowled the sidelines. Weir put DCU’s failures down to the lack of depth in the squad. With this quality and development on display, there must be more done in order for the competition to maintain its credibility. Once again this year the eligibility of certain players has come into question. I.T Carlow were thrown out only to be re-instated after an appeal. The Sigerson cup also had its share of controversies with both I.T Sligo and Queens ejected but again were reinstated after appeals. Weir also calls for the edition of younger up and coming referees in order to combat favoritism. Still sore from the decision by Brian Galvin to send off one of his players in the opening match against CIT, Weir says “who sends off a player in the opening three minutes? Weir has confirmed that he would like to stay on next year and that he was happy with his first stint into college hurling. Although the team will be losing the likes of Galway U-21 All-Star, Padraig Brehony, there are promising hurlers on the fresher squad that are chomping at the bit for Fitzgibbon hurling. The year was unsatisfactory in terms of results but with lessons learned Weir is confident that DCU will see Fitzgibbon glory soon.